I love learning about a place by learning about its food. Seeing similarities to other cuisines but with subtle differences adds to the understanding of a place. In The Food of Oman , of which I received a review copy, I learned about the mix of Bedouin traditional foods and ingredients and flavors brought there by the Indian Ocean trade routes. Those flavors that make up Omani cooking are found in the Middle East, South Asia, East Asia, and East Africa. Many ingredients are used in dried or preserved from like dehydrated coconut milk, dried limes, and salt-cured fish because of the history of needing those foods to last for distant travel both on land and at sea. I’ve used dried lime before, appreciate the concentrated flavor, and couldn’t wait to use it again. There are comfort-food rice dishes that are common for lunch meals in Oman like Arseeya, a savory chicken and rice porridge; Omani Lentil Soup made with dried lime, ghee, ginger, coriander, cumin, turmeric, and more; and Sur Vegetable Biryani with layers of spiced vegetables and rice. One of the rice dishes I want to try soon is Mandi Djaj which is a popular take-out dish of turmeric and saffron spiced rice cooked below roasted chicken and spicy, smooth hot sauce on the side. There are also fish dishes, curries, vegetable sides, and breads and savory snacks. The Royal Sticky Date Pudding looks very hard to resist, and Samar’s Date Cake baked in a bundt with date syrup swirled on top is tempting me as well. I enjoyed the stories about foods cooked over live fires at beach parties and at roadside stands. The kebabs in the book all look delicious. But, the Gingery Tamarind Yogurt Marinade and Fiery Tamarind Barbecue Sauce captured my attention first. The marinade was to be made with seedless tamarind paste. I found a product from Thailand that is packaged as a softened concentrate ready to use and was able to skip the step listed in the recipe below for softening tamarind in boiling water. The tamarind liquid was whisked into yogurt with cold water, vegetable oil, minced ginger, minced garlic, black lime powder, and salt. I had some black, or dried, limes in my pantry because they last for at least two years. I broke one into pieces and ground the pieces in a spice grinder to make a powder. It smells wonderfully like lime with a little interesting earthiness. 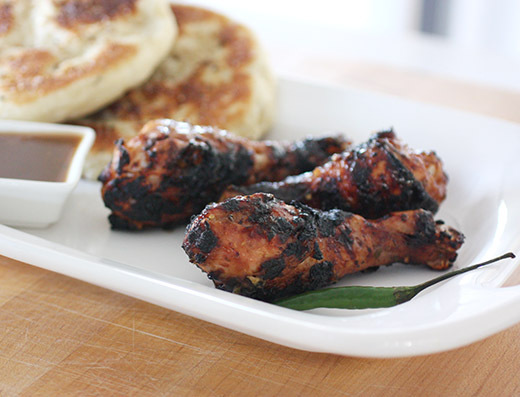 The marinade was poured over seasoned chicken pieces, and the chicken was refrigerated and left to marinate for an hour or longer. The author describes the barbecue sauce as addictive, and I was eager to find out if that was true. The sauce was made with more tamarind, minced Thai bird’s eye chiles, garlic, salt, and I used honey rather than sugar. The mixture simmered for several minutes and thickened. I grilled the chicken over wood coals, and basted it at the end of cooking with some of the sauce. Indeed, I could see how this sauce could be habit-forming. It’s tangy and spicy and just sweet enough. While the chicken marinated, I also made Mkate Wa Ufuta or Zanzibari Sesame Bread. It’s a delightfully simple dough of all-purpose flour, coconut milk, and an egg. After rising, the dough was divided into pieces, each piece was flattened into a round and cooked in a hot cast iron skillet with sesame seeds added to each side. It was puffy and chewy and a perfect vehicle for scooping up any sauce left on the plate from the chicken. I’m going to enjoy learning more about the country as I eat my way through the book. Recipes reprinted with publisher’s permission from The Food of Oman: Recipes and Stories from the Gateway to Arabia by Felicia Campbell/Andrews McMeel Publishing. Break the tamarind paste into pieces and place in a small bowl; pour the boiling water over it and let soften and cool, about 30 minutes. Mash the tamarind by hand in the water to break it up. Using a fine-mesh sieve, strain the tamarind concentrate into a bowl, a little at a time, using a wooden spoon to firmly mash and press the pulp to extract as much liquid as possible, occasionally scraping the pulp on the underside of the sieve into the bowl. This will take a few minutes. Discard the mashed fibrous pulp in the sieve and set the liquid (about 1/2 cup) aside. Whisk together the yogurt, cold water, oil, ginger, garlic, black lime powder, and salt in a medium bowl; stir in the tamarind liquid and adjust the seasoning with salt to taste. 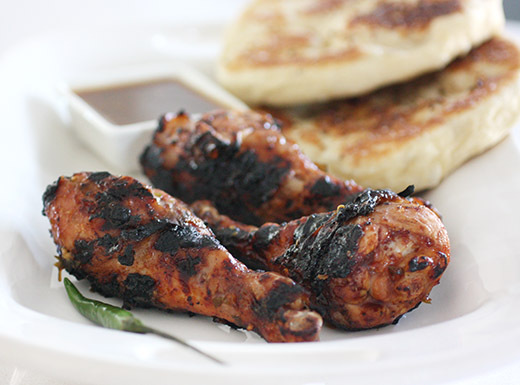 Use as a marinade for chicken or meat, allowing the proteins to marinate at least 1 hour. 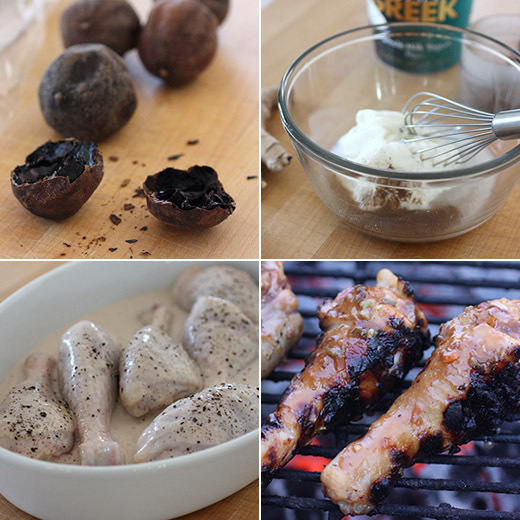 Shake off any excess marinade before grilling. Break up the block of tamarind into a few pieces and place in a medium saucepan with 3 cups water; bring to a boil over medium-high heat, lower the heat to medium, and simmer, stirring constantly with pressure to break up the tamarind, until the tamarind has softened and the mixture has thickened, 5 to 7 minutes. Using a fine-mesh sieve, strain the tamarind concentrate over a small saucepan, a little at a time, using a wooden spoon to firmly mash and press the pulp to extract as much liquid as possible, occasionally scraping the pulp on the underside of the sieve into the bowl. This will take several minutes. Discard any mashed fibrous pulp in the sieve. Add the chiles, garlic, sugar, and salt to the tamarind liquid and bring to a simmer over medium heat, then cover (as it will sputter), decrease the heat to low, and cook 10 to 12 minutes, until thick and darkened. Turn off the heat and let sit 5 minutes. Adjust the seasoning with salt and sugar to taste, and add a little water to thin the sauce out, if desired. Serve alongside grilled chicken or meat or atop roast meat or vegetables. If the sauce becomes too thick before using, reheat over low heat, adding a little water as needed. I’ve always loved tacos, but for the last twenty-three-plus years of living in Austin tacos have been a way of life. There are breakfast tacos, lunch tacos, fancy tacos, quick and cheap tacos, and occasionally home-made tacos. But, I had never ever made my own tortillas. To my mind, it was like a Parisian making her own baguettes. All of that just changed last week. I had read my review copy of the new book Tacos: Recipes and Provocations by Alex Stupak and Jordana Rothman and was convinced I needed to make fresh, homemade tortillas for the best homemade tacos possible. It’s made clear in the book that the just-off-the-griddle-ness of the tortilla has everything to do with the quality of the taco. There’s even a break-down of ways to store warm tortillas if necessary, and each taco recipe suggests when to cook your tortillas in relation to other steps for ideal timing. I was ready to give tortilla making a try. What I really appreciated about the message of this book is that “authentic” is difficult to nail down especially when a cuisine continues to evolve, but delicious is pretty straightforward. The approach here is to show the steps involved in making the best tasting tacos possible, and that starts with absolutely fresh, hot tortillas. There are detailed instructions for making your own nixtamal for corn tortillas, working with prepared masa or masa harina, making fresh wheat tortillas, or making alternative tortillas with added flavors. There are pretty beet, saffron, and pistachio options, and now I want to try them all. Next, there’s a chapter on salsas made with both fresh and dried chiles, and then the Tacos chapter itself. There are Chicken Tacos with Kale and Salsa Verde, Duck Carnitas Tacos, Bay Scallp Ceviche Tacos, Black Bean Hummus Tacos, and even Deviled Egg Tacos. The ideas range from fun and unique to labor-intensive and traditional, and they all sound like crowd-pleasers. I decided to start with Spinach Tortillas made with store-bought masa harina and paired them with the Fish Tempura filling. I used local, little spinach leaves, and they were blanched and squeezed dry first. I chopped the dried spinach by hand and mixed it into the masa harina while stirring in the water. The dough comes together very easily. The head note for the Spinach Tortillas suggests pairing them with grilled fish, but I went the Fish Tempura route instead. Fish tacos is one of my favorite categories of tacos, and of course I have opinions about what toppings should be used. The recipe here suggested mayonnaise, but I’m partial to sour cream mixed with lime juice and ancho chile powder. Shredded cabbage is a must, radish slices are nice, and beyond that not much else is required. I used Mahi Mahi fillets that I skinned and cut into chunks. The tempura batter was made with rice flour, all-purpose flour, baking powder, and beer. The fish pieces were seasoned and dusted with flour before being dipped in the batter and fried in hot oil. A few pieces at a time were cooked for about five minutes. The tortillas were made by taking a golf ball-size piece of dough at a time and slightly flattening it between the palms. I lined a tortilla press with pieces of plastic cut from a storage bag, and pressed each tortilla. From the press, it was passed to a hot griddle where it was cooked on both sides. The tortillas went from the griddle to a towel-lined Dutch oven to stay warm. First, tortilla making instantly joined my list of top five kitchen tasks I love most along with making fresh pasta and pitting cherries. It was surprisingly fun. I’ve made other flatbreads, but this was different and better. Second, a perfectly fresh tortilla really does make a huge difference in the quality of a taco. This was a fantastic meal. And, making tortillas is not difficult once you have the timing down. I may not make all of the tortillas I eat at home myself from now on, but I’ll definitely be making some of them and in various flavors. Recipes reprinted from Tacos: Recipes and Provocations by Alex Stupak and Jordana Rothman. Copyright ©2015 by Empellon Holdings LLC. Photos by Evan Sung. Published by Clarkson Potter/Publishers, an imprint of Penguin Random House LLC. Eat these wholesome tortillas with a piece of steamed or grilled fish, or just a pat of butter, a pinch of nutmeg, and salt. When incorporating blanched greens into masa, remember that certain varieties—especially spinach—hang on to moisture like a sponge. You really need to work to squeeze out the water or the dough will be too sticky. Place the masa and chopped spinach in a large bowl and knead gently until the greens are evenly distributed throughout. INSPECT THE DOUGH: You want the texture to be as soft and moist as possible without sticking to your hands. If the dough develops small cracks when squeezed, it is too dry and needs more moisture. To correct this, knead water into the dough in 1 tablespoon increments until it becomes malleable and forms into a ball. Cover the dough with a damp towel. MAKE A TEST TORTILLA : Grab a small handful of the masa and roll it into a sphere about the size of a golf ball. Gently flatten it into a rough disk with your fingers. Position the tortilla press with the pressure handle on the side of your body that you favor—if you’re right-handed, the handle should be on the right. Open the press, keeping the plastic squares on each plate. Center the disk of masaon the bottom plate. Close the top plate, ensuring that the second piece of plastic lands squarely on top of the dough. Fold the handle and apply even pressure. Fold back the handle and open the press. Peel the top plastic from the tortilla. The tortilla should be 5 inches in diameter and about 1⁄8 inch thick. Pick up the bottom plastic square with the tortilla stuck to it. If you’re right-handed, pick it up with your left hand; if you’re left-handed, pick it up with your right. Flip the tortilla over onto your empty palm; the upper edge should run along the tops of your index and middle fingers. Peel off the plastic. COOK THE TORTILLA : Position yourself over the cooler end of the griddle, with the tortilla draped over your palm and the top of your hand parallel to the hot surface. Bring the edge of the tortilla to the griddle and very quickly slide your hand out from under it; the tortilla should stick right away to the surface. If you’re too slow, the tortilla will fold and cook unevenly. TASTE YOUR TEST TORTILLA : If the dough is too dry, the texture will be heavy and the edges will begin to crack. If needed, gradually add water to the remaining dough in 1 teaspoon increments until it is moist and malleable. 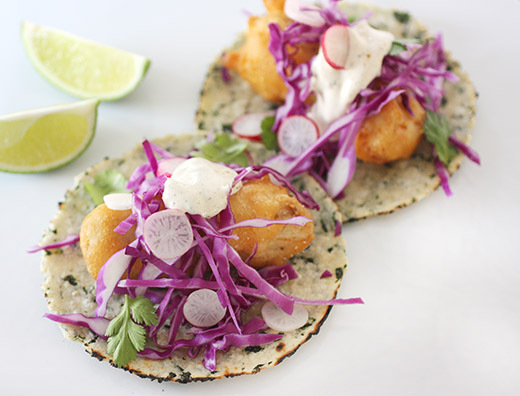 I’ve heard legends about how crispy fish tacos became a religion in Baja: that Japanese fishermen docked in the region and married their tempura traditions to the available Mexican ingredients. But however it came to be that fried fish met crunchy cabbage and cool mayo on a tortilla doesn’t matter all that much to me—it’s just an awesome taco. At the restaurants, we use dogfish, a small school shark known as cazon in Mexico. But the beauty of this taco is in its flexibility; just about any light-flavored, white-fleshed fish will perform well. 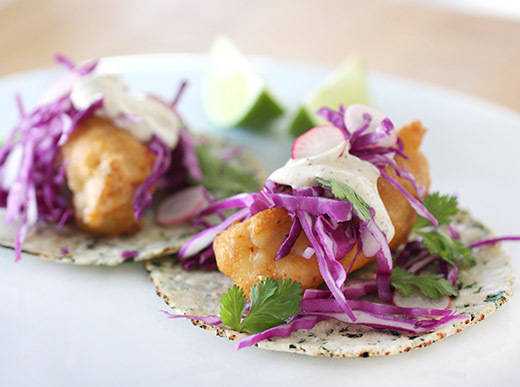 It’s the batter that makes or breaks a good fried-fish taco, and this one is dialed in. The key is not to overwork it: mix the batter too much, and you’ll start developing the flour’s gluten, which will make for a chewy crust. And keep the batter cold, as you would a pie dough; store it in the refrigerator until the last possible moment, for the best results. Portion the fish into 12 even pieces, each about 3 inches long. Store in the refrigerator until ready to use. In a large bowl, mix 1¹⁄³ cups of the rice flour with the all-purpose flour and baking powder. Pour the beer into the bowl and whisk gently. Don’t overwork the batter; a few lumps are okay. Place the batter in the refrigerator until ready to use. Place a 5 1/2-quart Dutch oven fitted with a candy thermometer over medium heat and add the vegetable oil, leaving at least 3 inches of space between the surface of the oil and the lip of the pot. Heat until the thermometer registers 350°F. Line a plate with paper towels and sprinkle the remaining 2 cups rice flour on a separate plate. 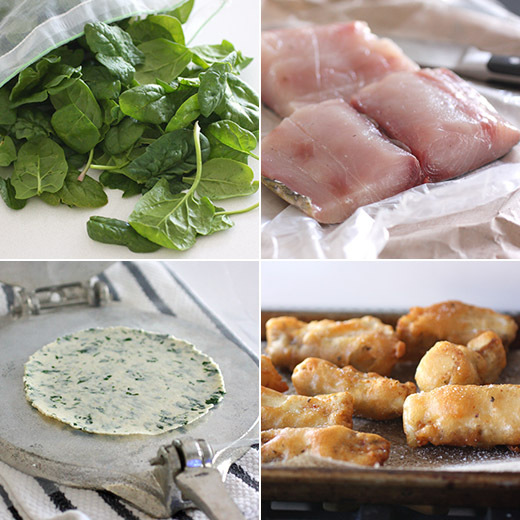 Remove the fish pieces from the refrigerator and season all over with salt. Remove the tempura batter from the refrigerator. Dredge the fish in the rice flour and then dip the pieces into the batter, one by one. Carefully add each piece of fish to the hot oil. Work in small batches so as to not crowd the Dutch oven. Fry the fish until golden brown, about 3 minutes. Transfer to the prepared plate and season immediately with more salt. ASSEMBLE THE TACOS: Lay out the warm tortillas on serving plates. Place 1 tablespoon of mayonnaise on each tortilla and spread using the back of a spoon. Add a small mound of the cabbage, along with some radish slices, minced onion, and chopped cilantro. Place one piece of fried fish on each tortilla. Squeeze a couple of the lime wedges over the tacos and serve the rest on the side. Aaaaaand, I’m back. We’ve moved back to our permanent property, into our new house, and I’m finally using my new kitchen. Regarding moving into a new house during the holiday season, I only recommend it if you’ve been waiting way, way too long for said new house to be completed. Otherwise, the whole process is much better suited to a time when you’re not missing all the celebrating and relaxing going on all around you. But, we’re so glad to be back. Waking up in the morning and looking out the window at our own yard and our own plants and trees is a delight. As soon as I got somewhat organized in the kitchen, I located my always-growing, to-try stack of recipes. The stack gets shuffled and reordered from time to time, and I lose track of what’s in there. After spending a few minutes flipping through the pages, I found some gems I couldn’t wait to make. First, I whipped up the Mafaldine with Shrimp and Lemon from last March’s Living magazine. 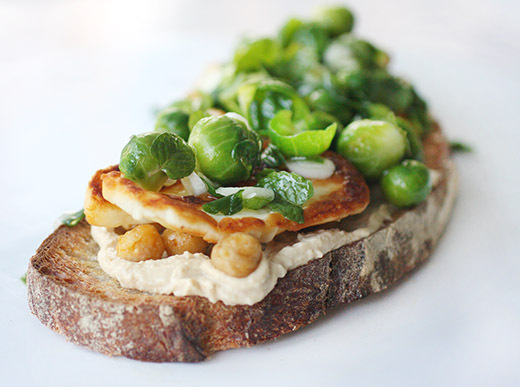 Next, I found the open-faced sandwich shown here that was from the October/November 2012 issue of Donna Hay magazine. My first thought was: which farms have local Brussels sprouts right now? The following morning, I saw a post on Facebook showing what was available at Boggy Creek Farm—including Brussels sprouts. Off I went, and I got there just in time to nab the last little basket of them. I found the green onions I needed at Springdale Farm. And, I wasn’t sure I’d find local mint at this time of year, but Springdale did still have some growing. This was going to be a fresh and lovely sandwich. The parts of this recipe are a mix of home-cooked and store-bought. I bought the sourdough bread and the hummus, and the chickpeas came out of a can. And, I made a few minor changes. The intent was to pull the leaves from each Brussels sprout, but these were fresh, tightly bundled, little heads I had brought home. As I cut the ends from each sprout, I collected any leaves that fell to the side and left the remaining sprouts intact. The sprouts and leaves were boiled briefly in salted water and then drained and rinsed in cold water. The canned chickpeas were rinsed and drained as well before being sauteed with garlic and chile flakes. After about 10 minutes, the chickpeas take on a darker, golden color and get crispy on the edges. You should mash some of the chickpeas as they cook as well, and the mashed ones get the crispiest. 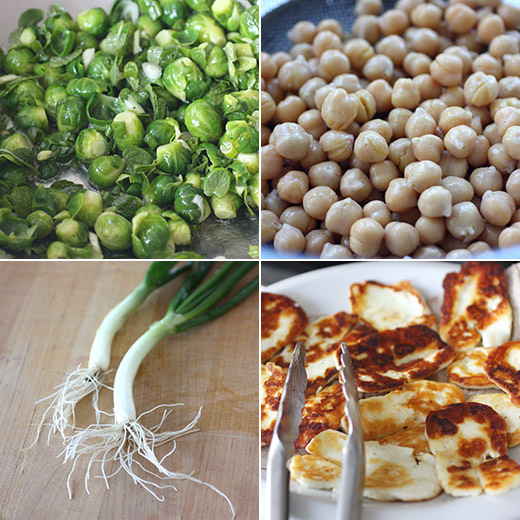 The next item to prep is the haloumi, and it was sliced and fried in olive oil until browned. The cooled Brussels sprouts were added to a mixing bowl with sliced green onion and chopped mint. Chopped cucumber was to have been added as well, but I skipped it. I wanted to make this all about the Brussels sprouts. Lemon, olive oil, and salt and pepper were added to the bowl, and the mixture was tossed to combine. 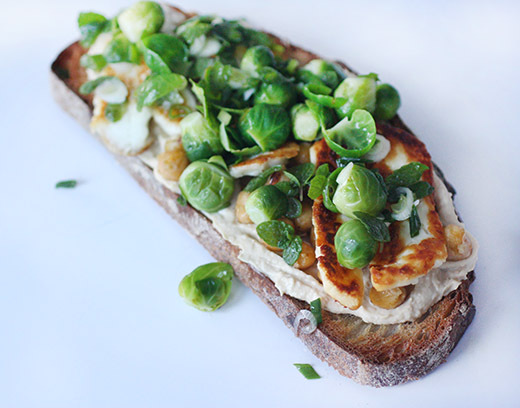 To assemble the sandwiches, I toasted slices of sourdough, spread each piece with hummus, topped the hummus with the sauteed chickpeas, layered on haloumi slices, and spooned the Brussels sprouts mixture on top. This is a knife-and-fork kind of open-faced sandwich but deliciously so. After my first bite, I was so glad I located and included the mint. It added a brightness and freshness to the lemony vegetable salad. And, haloumi. No explanation required. It continues to be one of my favorite ingredients. Overall, this was a great combination for a vegetarian sandwich. I have several new books to cook from as I continue to break in my new kitchen and try to remember where I’ve put everything. Stay tuned for more food coming soon. Happy New Year!